I believe that I have very intelligent friends; I really do. But, over the last few days, I have been very sad over things that have been posted to some of my friends Facebook pages. The topic has been Ebola. This is a scary topic for people, especially if you are watching the fear mongers on the news, and I mean every news channel and broadcast. This is not unique to Fox News, CNN, or any other channel, it is across the board. A lot of people don’t realise, “news channels” do not exist to tell you the news, they exist to sell you their brand of “news” over the other sources. The more “news” they sell you on, the more they can charge their advertisers for commercial air time. News channels will hype and exaggerate simply to get and keep you watching. The facts have nothing to do with it. It’s about how much money can they make by keeping you watching. Take a moment to read through my post and I hope to relieve you of your fears about Ebola in the United States. Why I care about this issue. I have a slightly unusual view to this situation than most. First, being HIV positive, I know what it is like to be shunned because of others ignorance of the disease. It still amazes me how many people, in 2014, still do not know basic information about HIV. But, there is another reason that I have unique insight into this situation. Back in early 1999, I spent several weeks in a hospital isolation unit. Not because I was contagious to others, but because I had no immune system and others were dangerous to me. This isolation unit was not at the CDC in Atlanta, nor at a major University medical center, but at a local community hospital. All staff and visitors had to enter a negative pressure room where they had to scrub their hands, put special covers over their shoes, put on a disposable Tyvex gown, hair nets, masks and goggles. They were not allowed to have direct contact with me once they were in the room. My room was a positive pressure room with a multilayer HEPA filter system. The ventilation unit scrubbed and recirculated the air many times an hour. All of my food had to be throughly cooked and prepared in a special unit and was brought to me in sealed trays that were unsealed in the air lock. The first week was very scary, but I managed to get through it, and here I am. Most have no idea just how fortunate we are in the United States. We have an excellent medical system, brilliant disease specialists, a national public health network and great wealth. These things simply do not exist in the Ebola inflicted countries in West Africa: Guinea, Liberia, Nigeria, Senegal, and Sierra Leone. 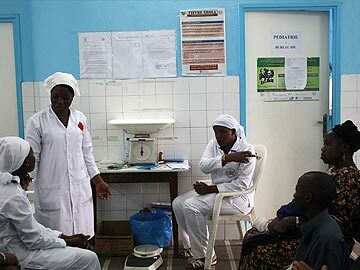 These are pictures from hospitals in West Africa. 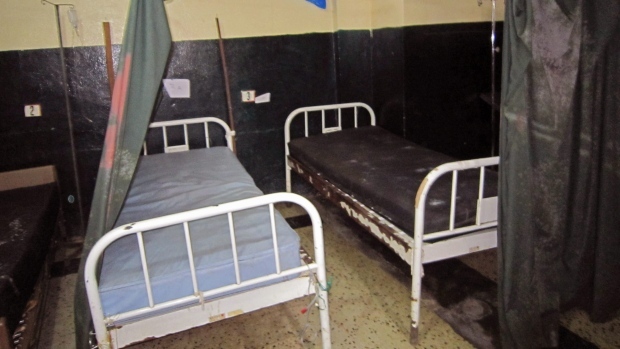 There are no private rooms, but rather large wards, where disease can spread quickly. But, because of the scale of this outbreak, There are not enough of these hospitals to take care of the sick. Therefore, make shift hospitals have been set up, most in tents. 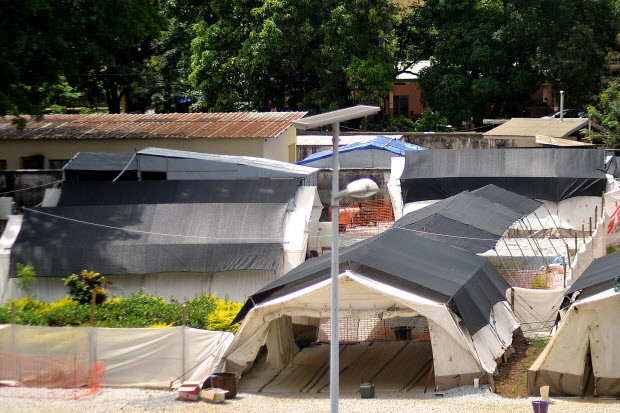 This is a picture of the Ebola Isolation wards at Donka Hospital in Conakry, The capital of Guinea. Conakry is a city of more than 1.6million people. To complicate this matter, the few hospitals that exist, and the makeshift Ebola wards have quickly become filled, forcing hospitals to close their doors and lock out countless numbers of sick, leaving them to suffer and probably die in the streets. This further increases the risk of spreading the disease. Many families are so terrified of this disease that they immediately throw sick family members out into the street, further exposing them to others in the community. Here is a video produced by the New York Times that highlights some of the situation, including footage of a young man locked out from a hospital and his family doing the best they can. These cultural and societal issues do not exist in the US. When someone is sick, we are able to immediately isolate and treat individuals in clean, sanitary conditions with effective care. That is the first step in preventing the spread of the disease. Some news stations have said that we should not allow anyone with Ebola to be transported to the US for treatment; that we are inviting the disease here. This simply is inaccurate and a terrible interpretation of the situation. As of this writing, We have transported four Americans with Ebola back home to the States. Three were treated at Atlanta’s Emory University, in special isolation units controlled by the CDC. A fourth was transported to a similar unit in Omaha, Nebraska. Some, if not all, of these patients were treated with the specialised care that exists in the US including a new experimental drug called ZMapp. All four patients recovered quickly and completely. The most recent situation in Dallas is one we knew would happen eventually. This patient boarded a plane in Liberia and appeared perfectly healthy. He passed the US managed health screening process before boarding the plane. A few days later, while in Dallas, he became ill. He was taken to hospital where, due to a communication issue, he was released. It is important to understand that the early symptoms of Ebola can look like the common flu. Unfortunately, when he told a nurse that he had recently flown from Liberia, that message did not get properly recorded, and he was not tested for Ebola. I have no doubt that this incident will not happen again. I know from my friends in healthcare that all staff attending a patient showing such symptoms are asking if the patient has been to West Africa recently. Having multiple people ask the question helps to eliminate a repeat of the Dallas situation. Another important bit of information is the layout of Hospital Emergency Departments in the aftermath of 9/11 and the bio-terrorism scares that followed. The Departments of Homeland Security, and Health and Human Services pushed billions of dollars to redesign Emergency Departments. Prior to these changes, many EDs had large open areas with curtains separating patient beds. The new EDs have individual rooms with sliding glass doors, many of which can be closed automatically at the push of a button. These rooms are often set up to be pressurised to help keep contagions in the room. All EDs also have good supplies of Tyvex suits, helmets, visors, and masks. We have the ability to isolate and secure. In Africa, they don’t. But the one thing that Americans do lack when it comes to Ebola is an understanding of what it is and how it is transmitted. The Ebola virus causes viral hemorrhagic fever (VHF) which refers to a group of viruses that affect multiple organ systems in the body and are often accompanied by bleeding. Ebola can only be definitively confirmed by five different laboratory tests. Early symptoms of the Ebola virus include sudden onset of fever, weakness, muscle pain, headaches and a sore throat. These symptoms can appear two to 21 days after infection. The World Health Organisation says these non-specific early symptoms can be mistaken for signs of diseases such as influenza, malaria, typhoid fever, meningitis or even the plague. Public health officials report that some patients may also develop a rash, red eyes, hiccups, chest pains and difficulty breathing and swallowing. The early symptoms progress to vomiting, diarrhea, impaired kidney and liver function and sometimes internal and external bleeding. The WHO says it is believed that fruit bats may be the natural host of the Ebola virus in Africa, passing on the virus to other animals. Humans contract Ebola through contact with the bodily fluids of infected animals, including when butchering for food. According to the WHO, Ebola later spreads from human-to-human via contact with bodily fluids containing the virus. The virus can be spread through contact with an object contaminated with infected secretions. Direct contact with the corpses of Ebola victims can also result in infection. We are so fortunate in this country. We have all of these important, vital things that we take for granted. We expect good care to be there and would be shocked if it wasn’t. We need to look at this situation like the smart, compassionate, world leaders we tell the world we are. We should put every effort we can into treating this in West Africa. Stopping it there, will prevent it from getting here. We live in a global society, where moving from one continent to another takes a few hours, not days or weeks. Be knowledgeable, be concerned, be observant, be compassionate, be generous; but, don’t be ignorant, don’t be scared. Educate yourself and others. Learn what the situation really is, not what a news network tells you because they are trying to increase their ratings so that they can charge more for commecials to sell you crap. West Africa needs us, and that is spelled U S.